Can you smell a symphony? If Le Laboratoire has its way, you soon will. The contemporary art and design sensor founded by academic and scientists David Edwards in 2007 was at Wired’s 2013 event in London this week, showing their latest creation: an olfactory experience unlike any other, delivered digitally like an email or instant message. Edwards and his former student Rachel Field revealed the second, and much more polished prototype of the Ophone at the show, which is a cylindrical device that rests atop a base supplied with a number of chemicals. It’s a “phone” in some respects, as its name implies, but it doesn’t transmit sound or receive sounds like your iPhone: It can receive encoded transmissions that tell it what kind of smells to play. No, that’s not a typo. Here’s how the prototype works: First, you go to a website and enter in a number of ‘movements’ for a ‘symphony,’ choosing a type of coffee, then a chocolate, then a caramel and a nut variety. Then, you can send this off to the Ophone’s servers, and it’s received by a smartphone that controls the device, which transmits the recipes via bluetooth. 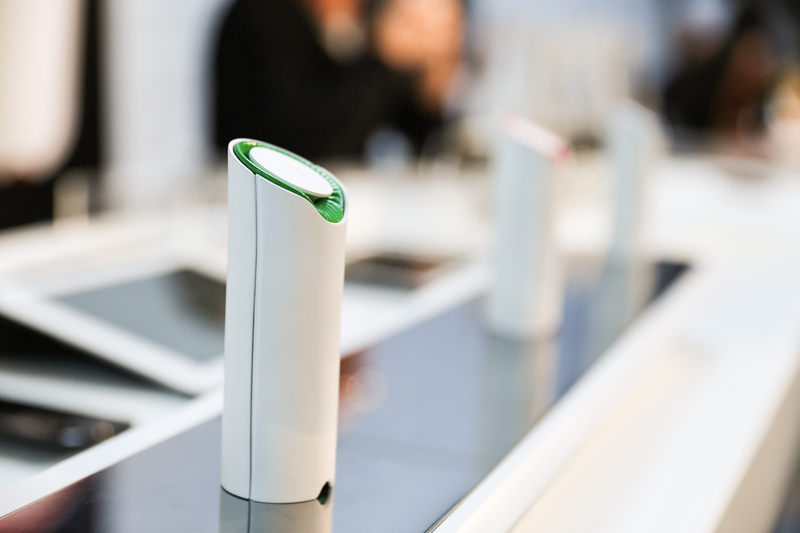 The Ophone combines its materials in the required complication to render those smells. The experience is the latest from the collective around scent and taste, as Edwards continues to try to explore the nature of olfactory processes as another type of communication on par with music, writing or anything else we might hope to offer up. Already, the company offers up capsules that spritz small serving doses of things like coffee, reduced to a fine dust, which can be brought on planes and are completely travel and customs safe. The more interesting possibility for the future, according to Edwards, is a vision where delivery mechanisms for the olfactory units are built-into every device, making it possible for your cell phone, TV remote control or anything else to offer up a scent shot. That’s what the company hopes to accomplish, given more time to refine the product and work out a final production Ophone-type device. The Ophone is currently the most advanced iteration of that vision. It’s much, much better than the typical smell-o-vision type inventions you’ll see trotted out at trade shows, as I learned via a nose-on. That’s because it’s remarkably subtle, and remarkably personal. There’s no haze of smell you have to walk through, for instance; and when you want the experience to end, you just draw you head back and the smell quickly fades. 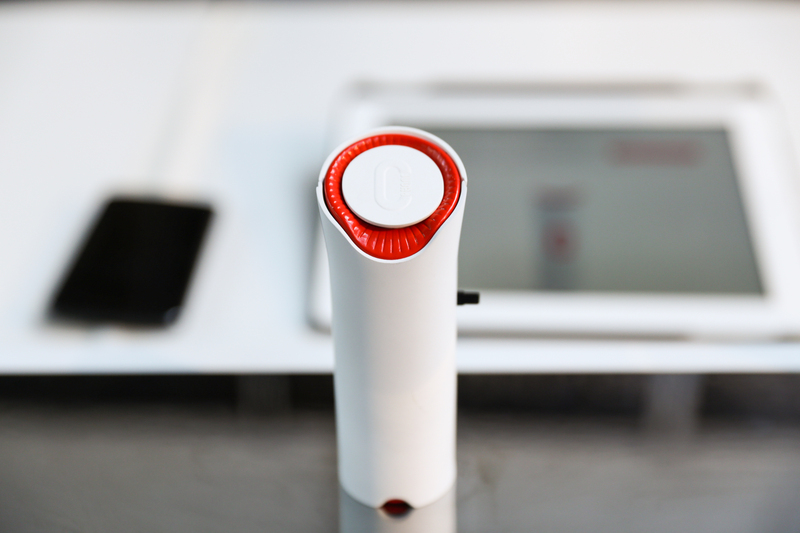 Currently, the Ophone prototype can produce up to 320 different smells, and working out the UI for that experience is its own challenge. Field says that they came up with the idea of symphonies, and the basic set scent selection as a way of making it more digestible, but in fact its extremely flexible, and they’re interested to see what people are able to come up with to interact with it once its more generally available. You can easily imagine a situation where people come up with various “scent recipes” and “scent apps” like they do now for lighting with the Philips Hue. The concept of a smell-based media device isn’t new, and it’s been applied to everything from TV to gaming, but the Ophone and the larger vision behind Le Laboratoire envision a much more expansive application of olfactory sense tech. It’s still pretty sci-fi, but it’s a lot more palatable (and eligible for consumerization) in this form than having a fog machine shoot a foul-smelling cloud in your direction, which is how others’ efforts have come off in the past.